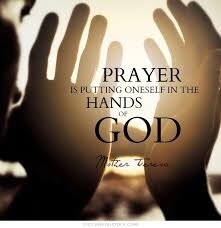 Prayer is what makes a difference in you so that God can make a difference through you. You don’t have to know how God will use you, you just have to know why: for love. Pray for those God has put around you and love them. Live as a child of the Light where you are. Put yourself in God’s Hands and let God take care of the rest. I have definitely found that to be true that God uses my prayers to transform my heart so that I can pray as He sees fit. Not in my own feeble understanding. Prayer is a laying down of self.